Kingston Technology Corporation has been synonymous with computer memory since its founding over 30 years ago. 16 years ago the HyperX brand was formed within Kingston to bring the highest performance memory to the market. Since then, the HyperX brand has expanded well beyond its memory roots into keyboards, mice and headsets. The latest product on offer is the HyperX Cloud Mix, an all-in-one headset that promises to be the one and only headset you will need for any use case. Can the Cloud Mix really deliver on this promise or will it end up being a jack of all trades and master of none? Inside the box we find the HyperX Cloud Mix headset housed in a nice plastic shell. We also have a variety of accessories included. 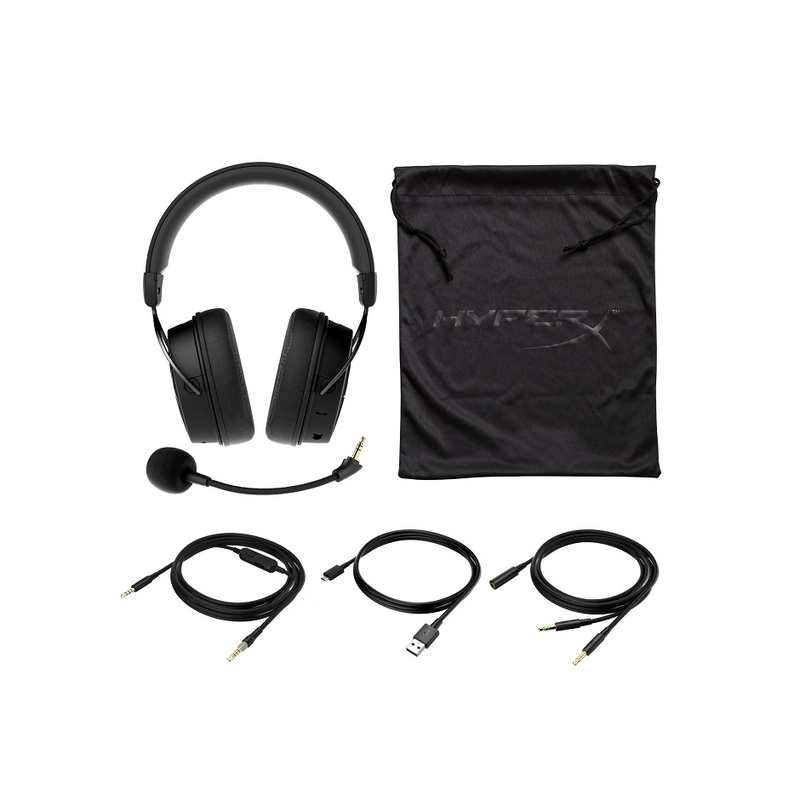 First up is a detachable boom mic, which has been Discord and TeamSpeak certified. A 3.5 mm auxiliary cable with in-line mic and volume controls provides easy access to customizing your settings. To accompany the auxiliary cable there is a splitter to allow for connection to a PC’s dedicated headphone and mic ports. To round up our cable selection is a micro USB cable used to charge the battery of the headset’s Bluetooth mode. For convenience, a cloth carrying bag has also been included that can house everything while not in use! Upon pulling the HyperX Cloud Mix from the box I was impressed with how slick the headset looked! The Cloud Mix features a pure black color scheme for every part of its design. To accent this color scheme are silver HyperX logos on the outside of each ear cup that look very striking. The frame of the headset is well constructed out of aluminum. The bare frame being exposed is kept to an absolute minimum, however, with only the adjustable sidebar and ear cup bracket showing. The outer ring of the ear cups, and boom mic, are coated in a soft touch finish which really feels great to the touch. The ear cups and headband have also been nicely covered in a leatherette finish and utilize memory foam to maximize comfort! All wiring found on the Cloud Mix has also been braided to not only add to the durability of the wire, but really top off the sleek design. Controls for Bluetooth mode can be found along the back of each ear cup with audio controls and power being on the right and a multi-function button on the left. Each button is made out of what feels a sturdy plastic. By far the greatest aspect of the HyperX Cloud Mix design is that it doesn’t give in to the tacky RGB fad that has consumed everything related to PC gaming over the last few years. Overall the whole design has a certain sophistication about it that really makes it appealing to own and use. Now that we have discussed how well the design looks how well does it hold up to use? In a word AMAZING, the Cloud Mix is one tough piece of tech! I don’t think I have put any single piece of consumer technology I own through more torment, aside from my childhood Game Gear, and have it come out unscathed. I have completely straightened out the head band, twisted it in a circle with no sign of stress on the overall frame. I then decided to fling it around like a maniac which hurt me more than the headset. To be extra thorough I decided to conduct multiple drop tests ranging from a gentle toss to an outright fling and again no sign of a structure fail in sight. As a final test of the Cloud Mix’s durability I decided to give the headset over to my wonderful little 2 year old to do with as she pleased. After reacquiring the headset after a couple hours it was once again just fine if not a little bit dirtier. Which reminds me, the Cloud Mix is very easy to clean! As you can see above the Cloud Mix has a pretty loaded set of specs and it certainly sounds the part! The dual chamber design present may sound like some marketing gimmick on paper, but it works as advertised. After running a few testing suites I am quite happy with the overall output and quality of the drivers. Highs come across vibrantly with mids filling my ears and the bass providing a satisfying level of thump. As I have been listening to music over the course of this review I have been hearing little details or instruments that I have long been used to not hearing with my cheaper quality headsets. Now I must admit that the majority of my time with the Cloud Mix was using it in wired mode, but thankfully the sound quality in Bluetooth was identical to my perception. And as an added note on Bluetooth mode, the battery life on the Cloud Mix is fantastic, lasting between 3-4 days per charge with moderate usage. Moving on to the gaming side of things, the Cloud Mix really delivers on the promise of being a universal headset. It works with an Xbox One, PlayStation 4, Nintendo Switch and PC with full voice and sound with absolutely no issues. The higher audio quality provided has even made me stop to listen to more of the ambient environment noises in games like Breath of the Wild. In Battlefront II I was loving the extra crisp *crack* a laser shot would make as it was fired. Positional audio for games like PUBG and Fortnite was also greatly enhanced compared to the mid-range headsets I am used to. Seriously if you are still using a $100 or lower set you really don’t know what advantages you are missing out on. The PS4 also detected the Cloud Mix as a Bluetooth device just fine. And for those of you wondering, I also found that the use of Dolby Atmos on Windows 10 and Xbox One worked very well. The last important aspect of the Cloud Mix that needs to be touched on is mic quality. To my surprise this headset actually utilizes two microphones! While the Cloud Mix is in Bluetooth mode a mic is activated in the ear cup that can be used to answer calls or give voice commands to Google Assistant or Siri. The quality of this built in mic is pretty standard, sounding clear enough for its intended purpose. I wouldn’t game or record with it but that’s ok because we have the detachable boom mic! This thing has been awesome to use for streaming while I have been on the road. While not quite the quality of a dedicated condenser mic, it is very impressive and can make a great substitute in a pinch. Voice work comes through with minimal noise and the noise cancelling technology built into it works far better than anticipated. I was impressed enough with what it wasn’t picking up, I decided to try and see how far it could tolerate by eating some chips in an open party chat. Yeah I was being that guy… but almost all but the most obnoxious chomps were left undetected. What Could It Have Done Better? There is honestly not much that I can criticize about the HyperX Cloud Mix, it provides great audio quality into an exceptionally tough build. That being said I do wish the detachable boom mic, awesome as it is, didn’t sound so bland. Listening back to recordings made during testing, they sound like they are missing the entire bass channel. Now, there is numerous options out there to help fix this so I wouldn’t in the slightest consider this a deal breaker. While I went into this review feeling the HyperX Cloud Mix headset would be a jack of all trades master of none type of headset, I have learned it is quite the opposite. Audio quality is top notch and in my experience only really beaten by a headset twice the price. Build quality is insanely durable, sleek and comfortable. The included mics can function to a number of different uses from broadcasting to simple voice commands with ease. Best yet, it works with virtually any device in existence through the use of wired and Bluetooth technology. Oh, and the battery life is awesome! While the $199 asking price may seem steep at first, the Cloud Mix really does deliver. For anyone who might be looking to replace a headset, I strongly encourage you to check out the HyperX Cloud Mix!